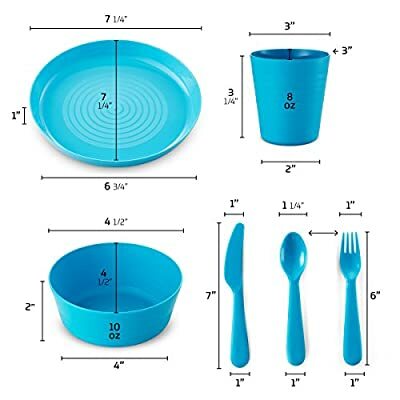 Plastic Dinnerware Set of 6 By Plaskidy- 36-Piece Kids Dinnerware Set Includes, Kids Cups, Kids Plates, Kids Bowls, Flatware Set, Kids Dishes Set are Reusable, Microwave - Dishwasher Safe, BPA Free. Product prices and availability are accurate as of 2019-04-21 19:07:07 UTC and are subject to change. Any price and availability information displayed on http://www.amazon.com/ at the time of purchase will apply to the purchase of this product. 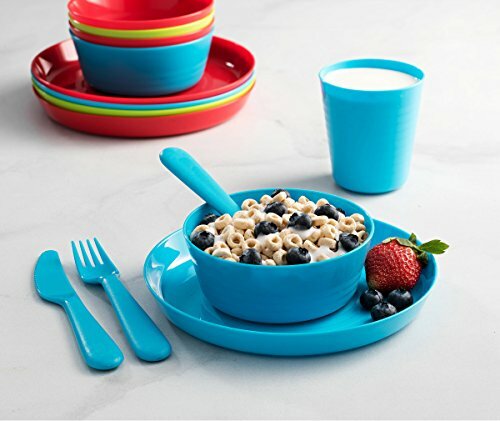 Finally, there is a full dinnerware set for kids that is unbreakable, reusable, microwave and dishwasher safe! Are you fed up by spending your money on disposable dishes, but you can't afford ruining your chinaware while serving your children? you want to rewarm your food, but your dishes are not microwave safe? Planning an outdoor picnic but who can afford to carry along nice dinnerware? Well.... PLASKIDY™ full dinnerware set is your answer! With the PLASKIDY™ dinnerware set you will save money, and enjoy a full dishes set meeting all your needs! 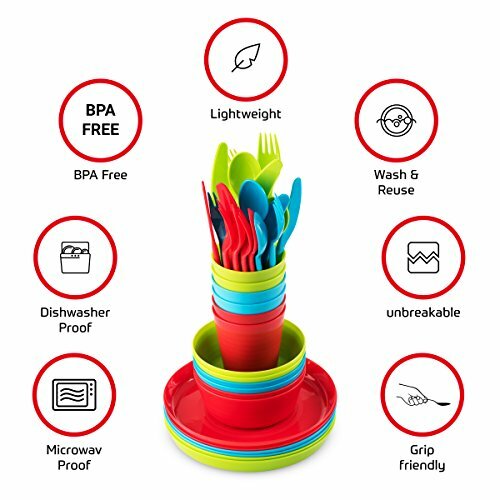 ?REUSEBLE & UNBREAKBLE: The dinnerware set is made of high quality pp material that is durable made to last and will not break even you are dropping it with force. ?MICROWAVE & DISHWASHER SAFE: The dishes are perfect for warming your child's dinner using a microwave, making easer to serve your child a warm meal, and you can just put in the dishwasher and get it back clean in no time.
? COMPACT & LIGHTWEIGHT: These plates, bowls, & cups are stackable to save space and weighs less then 2 pounds making it perfect to storage and carry to your picnic and party. 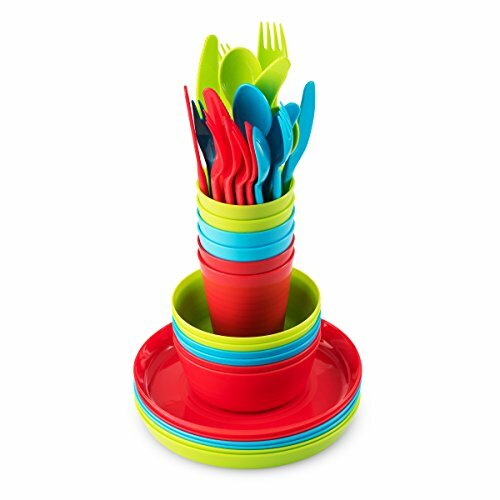 ★FUN ASSORTED COLORS: Our shatterproof dinnerware set for children is available in bright and vibrant colors that will Add a Touch of Fun To Your Child's Meal Time. Click On The Add To Cart Button Now To Make Snacking And Mealtime Fun And Safe For Your Child!
? PREMIUM QUALITY FOR YOUR CHILD: Plastic dinner set by PLASKIDY™ is Perfectly designed for toddlers & kids, made using the highest quality plastic that is durable and lightweight, break resistant material, and grip friendly, while being designed with fun, assorted colors, Perfect for your children who tend to drop, spill, and make a mess in their eagerness, to learn how to eat on their own. ?CHILDRENS FULL DINNERWARE SET: Our kids dinnerware set is made to provide parents with a full dinner and snack set for their children that will meet all their needs. 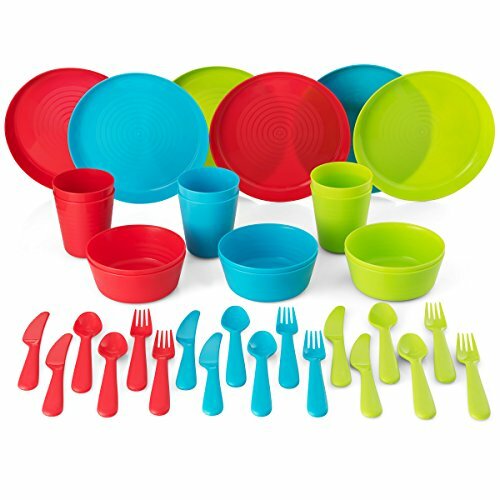 This 36-Piece Kids Plastic Dinner Set includes ,6 plastic cups for kids, 6 plastic bowls for kids, 6 plastic plates for kids, 6 knives, 6 forks, 6 spoons, PLASKIDY™ 36 Piece plastic dinnerware Sets will soon become your child's favorite plastic dinnerware set. ?DISHWASHER & MICROWAVE SAFE: Our kids dishes set are made to make it easier for you to feed your toddler. These are perfect for warming your child's dinner using a microwave, No harmful chemicals are released during the heating process and can be used to store food in the freezer for later use, and since these are dishwasher safe you can just add them to the dishwasher to clean. ?NON=TOXIC & BPA FREE: Before you start worrying about giving your toddler food in plastic dinnerware, you should know that we used only BPA-FREE Plastic that has absolutely no toxic materials used in the process to ensure good health for your little bundle of joy. These utensils are completely safe for child use and thanks to their unique design you don't have to worry about dealing with any cuts. ?BEST FOR PICNIC AND PARTY: Make your picnic and party more enjoyable & easier when using PLASKIDY™ dinnerware set. Its compact, lightweight and stackable, that meet all your comfortability needs while partying. in addition, the product is designed with assorted colors that will make your family / friends gathering abundance of fun.